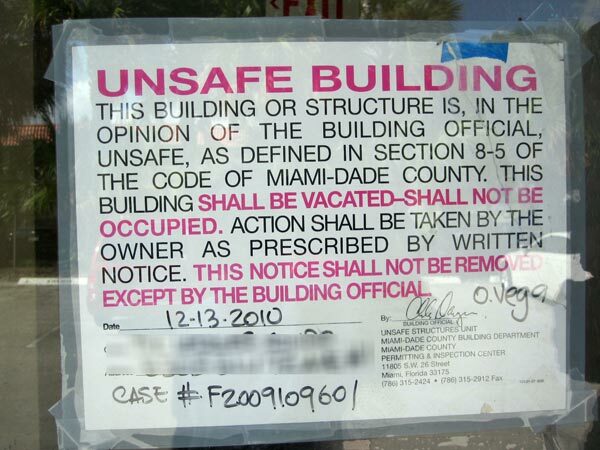 It is an unfortunate, but important fact that most homes in South Florida have existing building and zoning violations. The Seller may or may not be aware of them and may or may not be hiding them. One thing is for sure, as the Buyer you want to do your research and be aware of them. It is also critical to know that your Realtor® cannot certify, guarantee or be held responsible that a home is free of violations at the time of purchase. Unlike many others agents, I do take the time to explain to my Buyers that this is something that they should research at the earliest possible stage of a contract, typically coinciding with the inspection period. Building and zoning violations belong to the property, not the owner who created them. If you buy a house with building and zoning violations, you inherit the problem. Sometimes nothing ever becomes of the violation. Other times, owners can go through great expense, worry and trouble to clear violations. Building and zoning violations are prevalent in South Florida primarily because of hurricanes. During times of destruction, repairs are often made as quickly as possible with whomever is available to do such repairs. 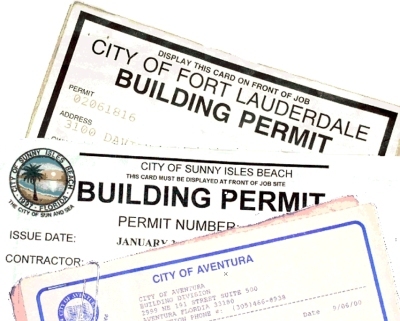 Often, permits are not pulled and even though the work is done perfectly, the fact that no permit is issued creates a violation. 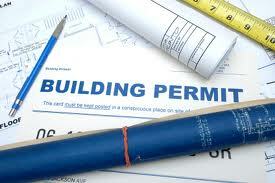 Other times permits are pulled, but for a multitude of reasons the work is never inspected and issued a close permit. So What Are Building & Zoning Violations? Building and zoning violations are categorized into three categories by the Building Department. Work Without Permit - Any improvement made to the property without a permit. Unsafe structure - When a structure is deemed unsafe because it poses a threat to human safety. This is typically abandoned property or a fire-damaged home. Some building and zoning violations are not what you would expect. These are violations issued by the Office of Neighborhood Compliance and include: illegal use of a home (illegal efficiency or multi-family use), illegal dumping/trash, lot upkeep, graffiti, illegal signs, commercial vehicle use/storage on premesis, illegal auto repairs and, although kind of strage, animal services violations (typically dog off leash or pet not getting vaccinations). As a Buyer, Why Do I Care About Building & Zoning Violations? If not corrected, building and zoning violations can turn into liens during the purchase process. Liens put a cloud on title and will delay or stop the home from closing. Therefore, Buyers and Sellers need to care about building and zoning violations. Remember, the Seller may not have caused the violation, but actually inherited it when they bought. As a Buyer, you have a negotiating window to have the Seller fix the violations before closing. The best time to negotiate is before the inspection period ends. Better to have the Seller clear violations before they become your problems. Even upon discovering violations, you can proceed with the purchase (so long as a property lien has not also be levied), but it is a risk. In some cases, work done without a permit (including additions, garage conversions, sheds, patios) are never caught, but if you get a violation later, the fines can be retroactive and punative. What Are The Steps In A Violation Case? 1. Complaint - Either the someone in the public or a government employee files a complaint with the local municipality. 2. Warning (Notice of Violation) - Homeowner is told about the problem and is given 30 days to comply with a remedy. 3. Ticket/Citation - Homeowner is fined for the non-compliance, typically a small fee under $600. 4. Recommendation to Record A Lien - If the homeowner doesn't pay the ticket/citation on time, a process starts to record a lien on the property. 5. Lien recorded - An additional monetary fine is added to the ticketed fine of at least $10,000. Title is now clouded. 7. Order to demolish the structure - If the homeowner ignores all of the above, the government will eventually level the structure *and* bill the homeowner for the cost to demolish. First, your Realtor® can partially look out for you regarding "Work Without A Permit" possibilities, as it relates to converted garages, additions, etc. because the tax rolls will show a different square footage or room/bathroom count. Visual inspection is also sometimes a giveaway that something may not be right with the work done. I will always point out what I see, as should any good Realtor®. After that, it will be your responsibility to search out real and potential violations. Of course, if you've hired a real estate attorney, they should do this for you; however, neither a Realtor® or the title company has this responsibility. To my knowledge, there is only one company Buyers can hire to performing these searches. SearchBeforeUBuy.com (or 1-888-202-5969 ext. 1) was started by people who used to work for the Miami-Dade Building Department and saw a need to assist Buyers and Sellers learn about and clear their building and zoning violations. They do these searches dozens of times per day and can take all the guess work out of what you are doing. The fee they charge is usually well worth the time Buyers don't have to spend. If you want to investigate violations on your own, here is generally what to do. First, many homes in Miami-Dade county will be in areas that incorporated (they created their own municipality, village or city). If so, you will be searching Miami-Dade records through the date of incorporation and local municipality records afterwards. Second, be aware that Miami-Dade Building Department records had periods of lost data. Generally, records have been kept since 1938. From 1938-1960 the records are almost all on paper. For those, you'll need to go to the Building Department and request records. From 1961-1972 no records exist due to microfilm deterioration (instead, you'll need to go to the Property Appraisers office who keeps secondary records). 1973-1989 has partial and difficult to find records as well. Since 1990, you will find good records, available primarily online. You only need to search for violations from the build date of the home! Since these violations can only be attached to the improved parts of the property, there is no need to go back before the structure was built. 1. The Miami-Dade Clerk of Courts website is the place to start. Across the top of the page there are four ways to search. Try all four if you have the data to ensure you don't miss anything. 2. Check to see if the property has any open permits that might eventually turn into violations by going to the Miami-Dade Building Department's permit search website. 3. Check for reports regarding Work Without Permit, Expired Permits and Unsafe Structures at the Miami-Dade Building and Neighborhood Compliance Department website. 4. If you have a home built before 1990, you can schedule an on-site Microfilm visit by visiting this website. As you can see, Miami-Dade County does provide lots of resources to perform searches. Be aware that if your new home is in a municipality (ex. Palmetto Bay, Pinecrest, Cutler Bay, Coral Gables) you must also search their records. Some of these incorporated municipalities will have online resources. Others will require you to go to their city hall.